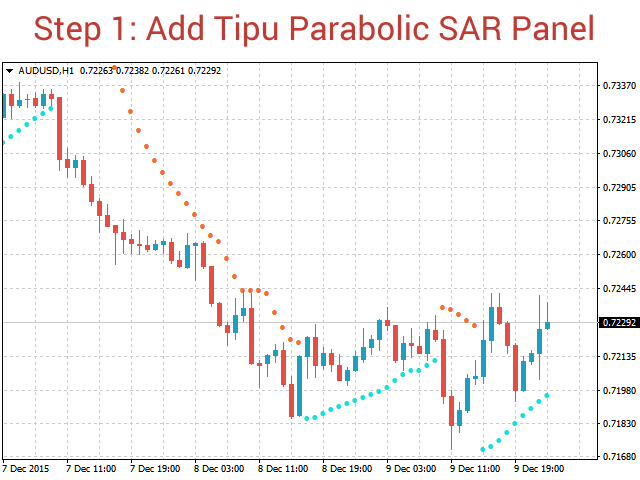 Tipu Parabolic SAR Panel is the modified version of the original Parabolic SAR indicator published by MetaQuotes here. Dashboard Panel (multi symbol) version for this indicator is available here. An easy to use Panel that shows the Parabolic SAR trend and signals of selected timeframe. 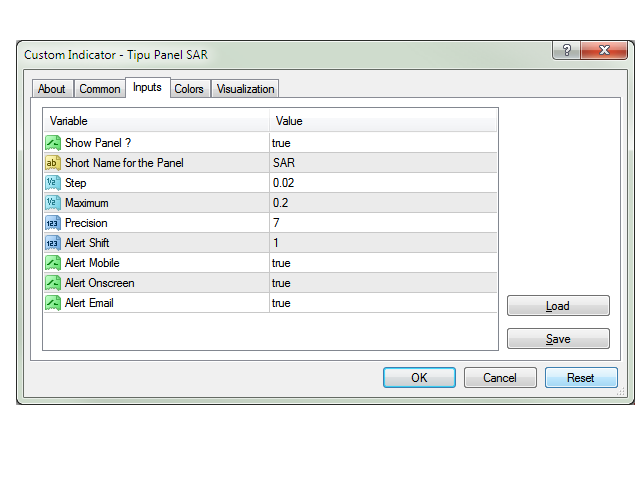 To enable these features you need Tipu Panel installed, found here. Parabolic SAR (parabolic stop and reverse) is a method devised by J. Welles Wilder in his famous book New Concepts in Technical Trading Systems. It is a trend-following indicator that can be used for trailing stop. J. Welles recommend using Parabolic SAR to determine trend and different indicator such as Average Directional Index to determine the strength of the trend. The blue dots below the candles mean uptrend, and red dots mean downtrend. These dots may also be used in for stop loss placements for the trade positions and sequentially moved one candle after another. As a best practice, it is recommended to consider signals from other timeframes and/or other indicators before making a trade decision. EPRICE(i-1) is the highest (lowest) price for the previous period (EPRICE=HIGH for long positions and EPRICE=LOW for short positions). Wilder, J. (1978). The Parabolic System. In New concepts in technical trading systems. Greensboro, N.C.: Trend Research. This is not your average Sar! Great product... ! Is it possible to make the EA? Great product, thanks for your generosity. Great indicator, especially if used with MACD/Stochastic. Отличный индикатор, точно определяет направление тренда, почти мгновенно реагирует на рост или падение курса! Разработчику ОГРОМНОЕ СПАСИБО за этот уникальный индикатор! very nice, easy to use! Updated alerts for the indicator. The alerts now include SL value. 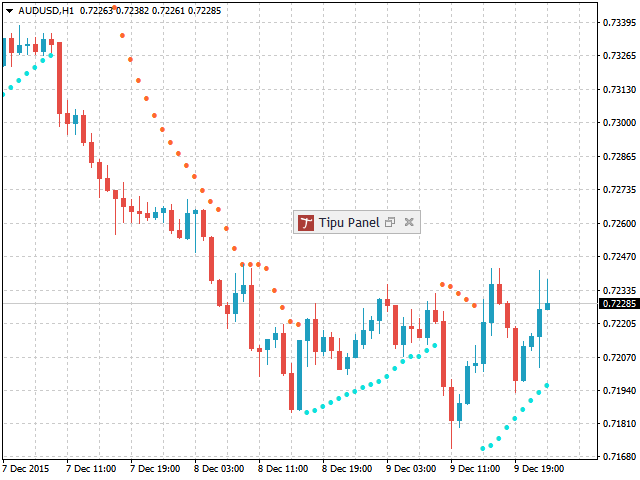 Added user option for displaying SL in pips on the Tipu Panel indicator. Alerts were showing when a chart window was closed. Tipu Panel was not updating. 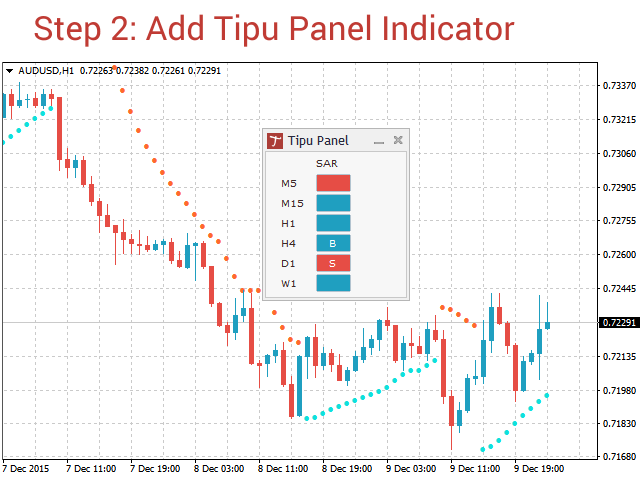 Fixed multi-time-frame alerts, if the Tipu Panel Indicator is installed. Fixed Alerts. Alerts are now independent of Tipu Panel.